For more information about the 2019 Annual Juried Student Show Prospectus Click here! 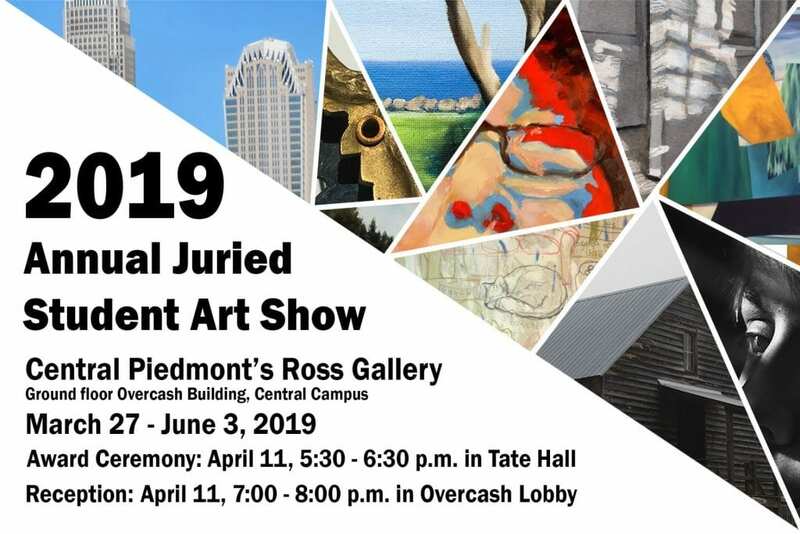 We are now accepting submissions for the 2019 Annual Juried Student Show! Submission deadline is February 28, 2019 and submission drop-off will be accepted Monday – Thursday from 10 am to 2 pm in Ross Gallery (first floor of Overcash Building). Completed entry form. Each submission must be signed by art faculty to verify the completion of the work was done during a class in the past academic year(Spring/Summer/Fall 2018 and Spring 2019). Download and print the entry form here. Submission images on a cd or flash drive. If you submit a flash drive, it will be returned to you in a timely manner. Entry fee of $5 for the first 3 submissions, cash or check. Checks should be made out to CPCC Art Galleries. You may submit up to 2 additional submissions for $5 each. The total number of submissions we can accept per student is 5 for a total of $15. This entry was posted in Uncategorized by Renee Cloud. Bookmark the permalink.